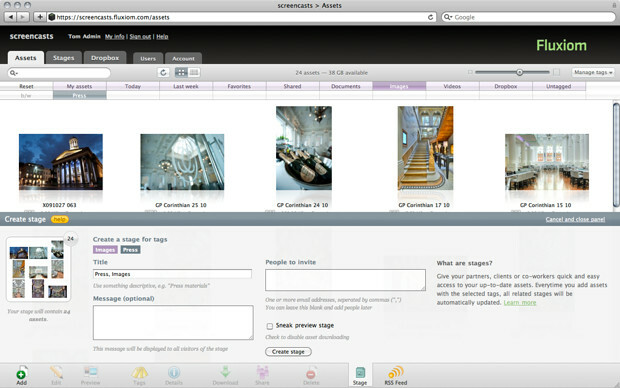 Fluxiom allows you to create Stages to share your Assets. Stages are secure websites that contain all the files associated with a particular Tag in your account. They update in real time as the contents of your account change. Access to Stages is limited to users you invite. To create a Stage, you must first create a Tag, from which the Stage will be built and updated. Once you have created this Tag, apply it to all the Assets that you want the Stage to display. For more information about Tags and assigning Tags to Assets, have a look here. 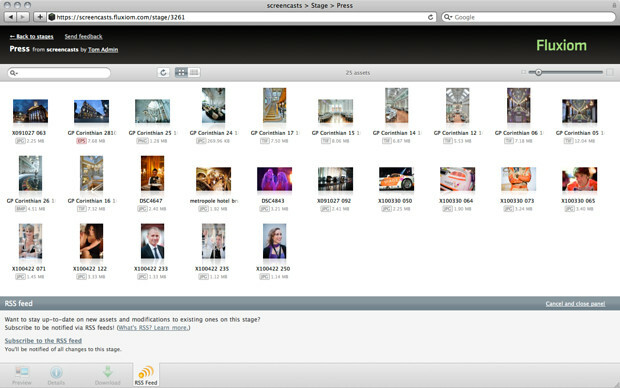 Click on the Reset Button on the left of the Search field, to display all the files in your Fluxiom account. Click on the Tag you want to publish as a Stage to display only the relevant files. This is exactly what your Stage users will see and have access to once the Stage is published. Click on the Stage Button to display the Stage Creation Panel. The Stage Creation Panel gives you control over the behavior of your Stage. Start by creating a title for your Stage. This can be whatever you want, but we recommend you make it descriptive, so that your users understand quickly what the Stage is about. Enter an optional message, this message will be included in the invite email. Check the « Sneak preview stage » checkbox to prevent users from downloading your assets. If this box is checked, users can preview the files you publish but not download the original files. This can be useful to help protect your intellectual property. Simply enter the email addresses of the users you want to invite in the « People to invite » field. You can enter multiple email addresses by separating them with a coma. Once you are done, click on the Create Stage Button. Fluxiom will create the Stage, set it up as you specified and send out invitations to the list of addresses you entered. You will also receive a copy of each invitation e-mail for your reference. Your Stage is now set up and ready to go. It will update itself automatically as you remove files from your account or add the Stage Tag to more files. These updates take effect immediately and transparently. There is no need to email your Stage Users manually. Fluxiom automatically sends out invitations that contain a link to the Stage, their user name and password to access the Stage. If a Stage user forgets his password, simply invite them to the Stage again, and a new password will be sent to them automatically. Stages automatically publish RSS feeds that contain links to newly published files. Simply click on the RSS Feed Button at the bottom of the Stage interface to subscribe. You will need an RSS reader to make use of the feed. If you use a web-based RSS feed reader, please be mindful of not sharing the feed contents with others unless authorized to do so. Once a Stage has been created, editing it is easy. Simply click on the Stages Tab in your Fluxiom account to see a full list of active Stages. From this tab, you can invite additional users to a Stage, revoke a user’s access or even delete a Stage entirely.